A simple layout with some elevated scenery, a few manual turnouts, a few simple structures, simple wiring, and a single power pack $300.00 per sq.ft. An average layout with automatic turnouts, simple structures, more complex scenery, and dual cab wiring $400.00 per sq.ft. 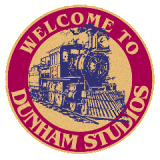 The average upscale Dunham Studios layout with a simple backdrop $475.00 per sq. ft.
A layout involving more complex scenery, track or complicated turnouts, major electronics, or involving custom scenic backgrounds $500.00 per sq. ft. or more for each specialty added. With the exception of our larger commercial or touring layouts the ceiling $600.00 per sq.ft. With the square footage arrived at, we then factor in a “degree of difficulty” multiplier (or divider) to reach a final estimate.